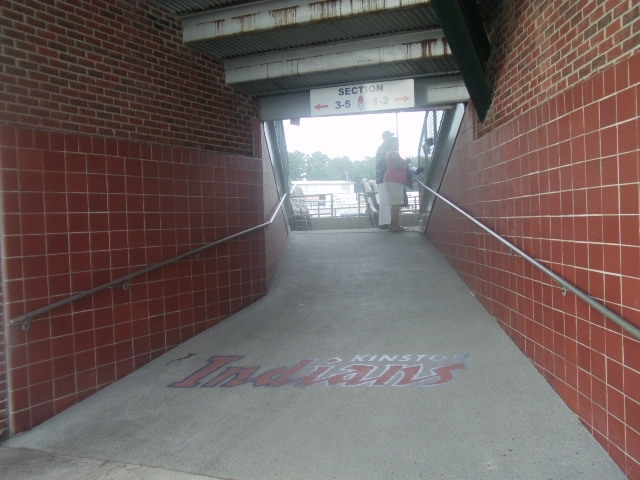 When it came time to for me to plan my road trip schedule this season, the team at the top of my “must-visit” list was the Kinston Indians. 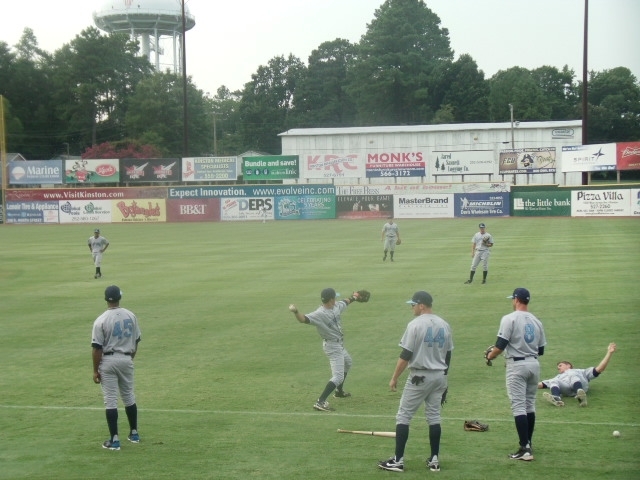 And for good reason — the longtime Carolina League entity is re-locating to Zebulon, NC next season, and in 2012 Kinston may very well be left without a professional team for the first time since 1977. 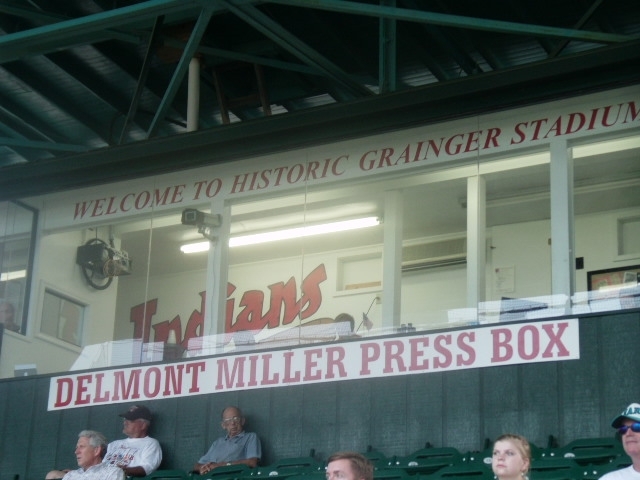 I went into the situation in more detail in Monday’s MiLB.com piece as well as a “Minoring in Business,” feature this past offseason. I also implore you to check out last season’s “Farm’s Almanac” feature on beloved Kinston host mother Evelyn “Mama” Kornegay. 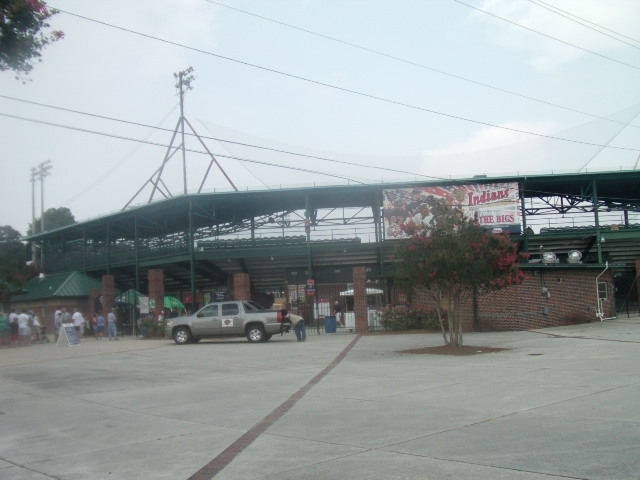 Grainger Stadium, built in 1949, is in the midst of a somewhat dilapidated residential neighborhood. 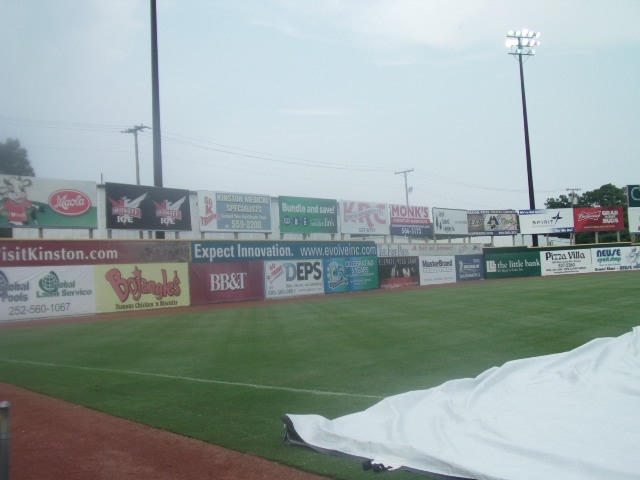 Upon entering the stadium and proceeding to field level, I was greeted by a most unwelcoming sight: a tarp on the field. It’s no surprise that Bojangles is featured on one of the outfield billboards — team owner Cam McRae owns 50 of these chicken and biscuit restaurants and is president of the Bojangles Franchisee Association. He’s Mr. Bojangles, if you will. But I didn’t have the Nitty Gritty Dirt Band on the brain. Instead, it was CCR: Who Will Stop the Rain? Well, I’m not sure who did (God is my best guess), but the threat of continued meteorological inclemency subsided and it became apparent that the game would be played on time. Thank goodness for that, as my road trip schedule doesn’t allow for make-up dates. While waiting for the game to start, I conducted a few player interviews with the Flipcam. Two things about those: T.J. House is a super nice guy, very genuine, and I’ll be rooting for him from here on out. I also interviewed knuckleballer (and, again, nice guy) Steven Wright, but lost the footage in a tragic post-production mishap. I hope to re-interview him again soon, because knuckleballers always make for great stories (or at least lazy sportswriters would have you believe). 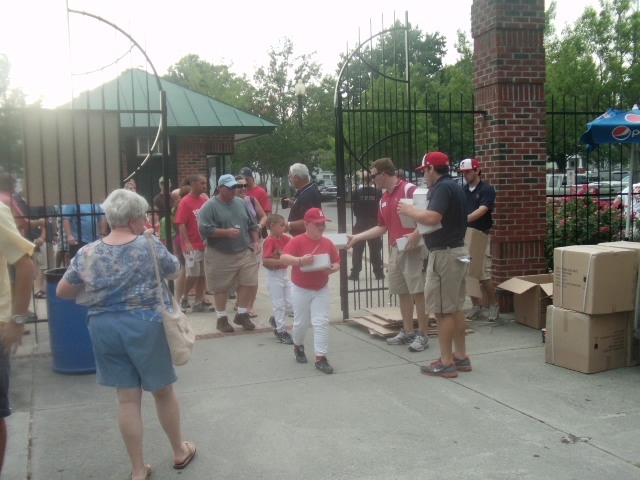 A good portion of the crowd arrived early, in order to get their hands on an Alex White bobblehead (in honor of one of last season’s fastest-rising prospects). With coveted bobbleheads stowed safely under the seats, it became time to stand at attention and honor America. You know the drill. Once the game began, I commenced to wandering. Some shots from around the stadium. 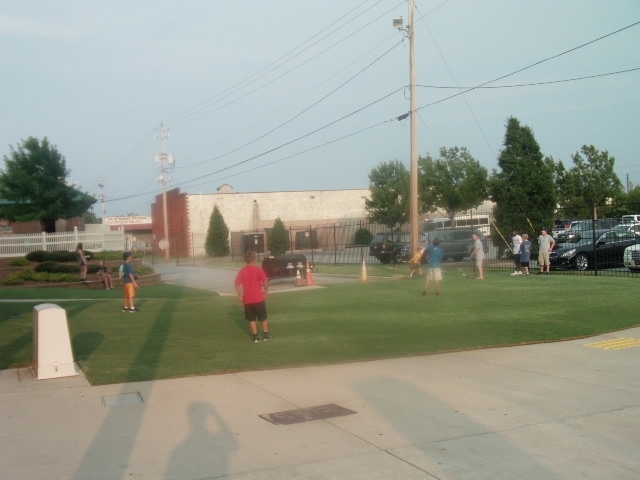 Out on the concourse, a group of kids were playing their own game of baseball. 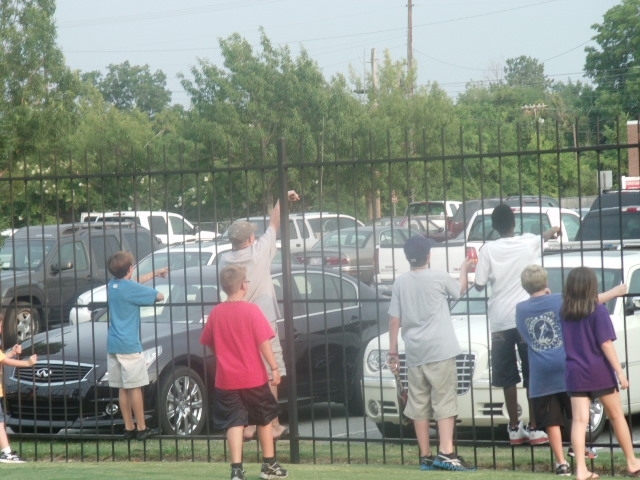 Said game was occasionally interrupted by the need to ask random parking lot passersby to retrieve a wayward ball. 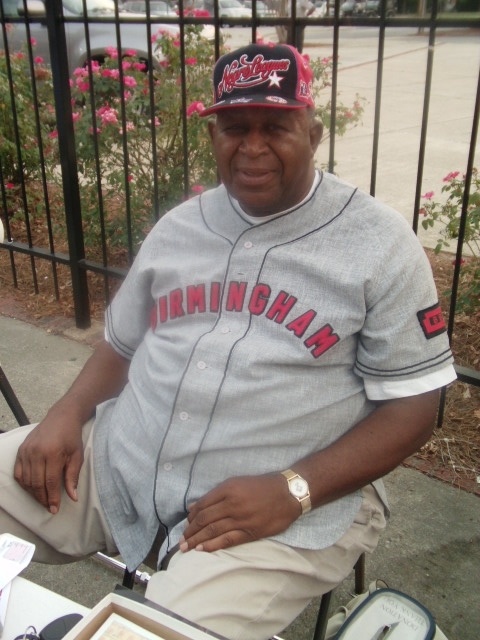 Out on the concourse I met Carl Long, a member of the 1952-53 Birmingham Black Barons as well as the 1956 Kinston Eagles (making him the first black player in Kinston’s professional baseball history). 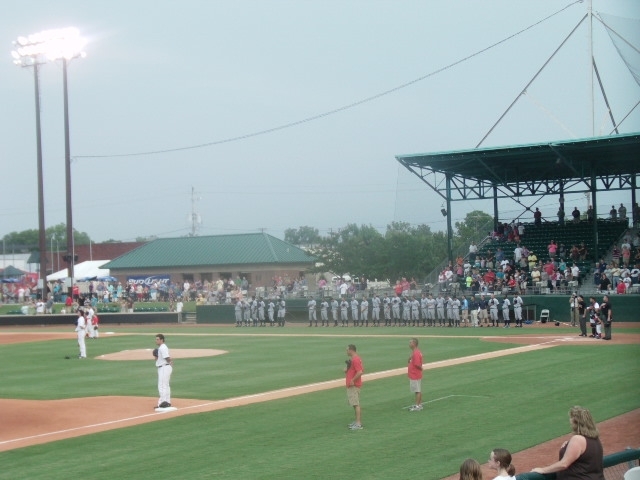 More on Long can be found in my MiLB.com piece. 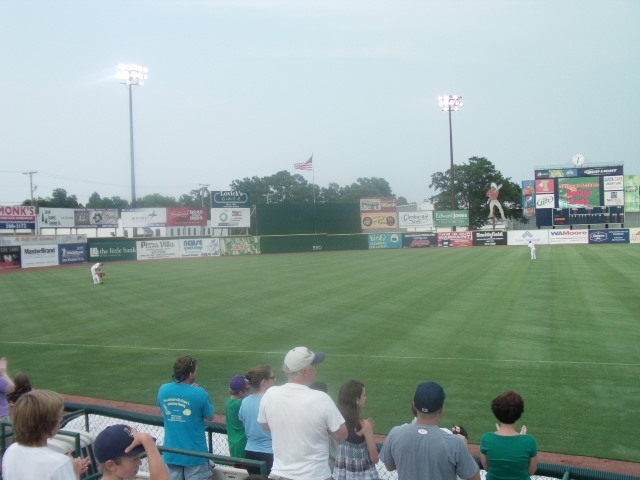 Despite the tarp’s unwanted presence earlier in the evening, it turned out to be a beautiful night for a baseball game. 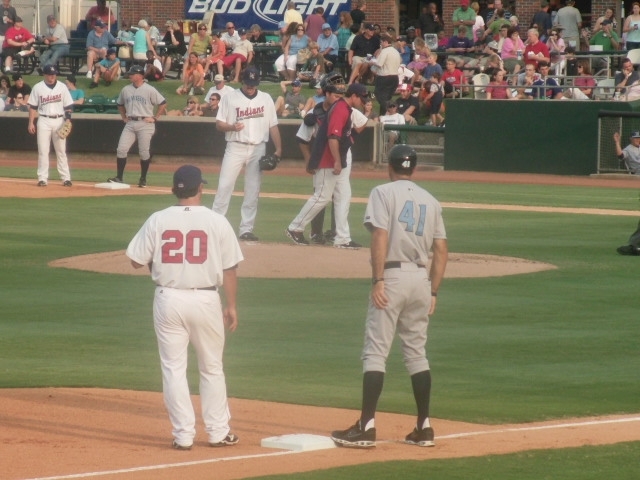 Wilmington Blue Rocks manager Brian Rupp (also seen in yesterday's post) continues to make a case for the stirrups. Third baseman Adam Abraham disagrees. 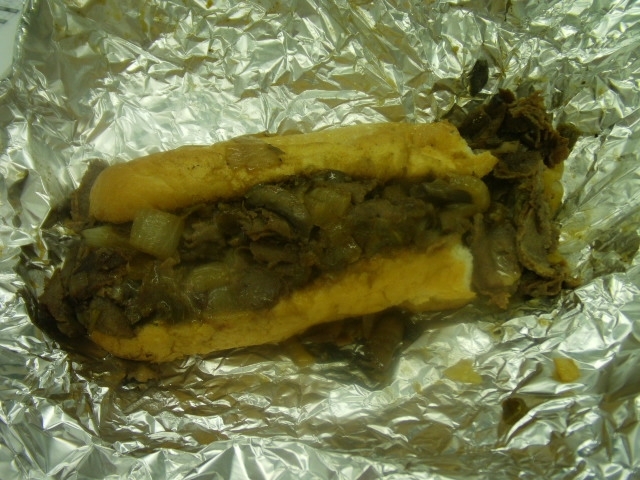 For dinner, I had the Philly Cheesesteak. 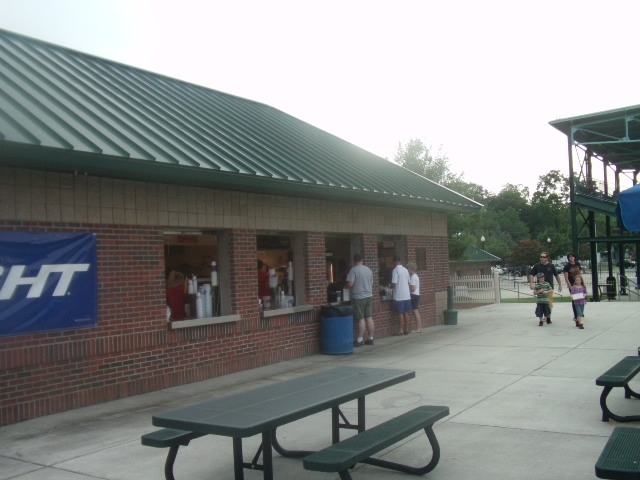 In normal circumstances I wouldn’t order a cheesesteak south of Blue Rocks territory, but Kinston GM Ben Jones insisted that his team’s version of this signature item was comparable to those served in the Northeast. My verdict is that it was very good overall and worth ordering, but presence of mushrooms and lack of Cheese Whiz and Amoroso roll made it not quite up to par with Philly’s finest. Dessert was courtesy of the local Maola ice cream company. 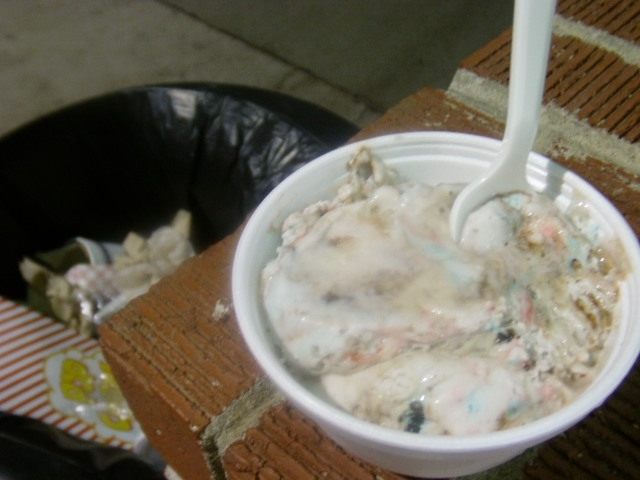 I ordered the “trash can” flavor, because it is my tendency to do such things. It was a bit too sweet for my tastes, but fortunately did not taste like an actual trash can. Trash Can ice cream towering over its name sake. and that was pretty much all she wrote. 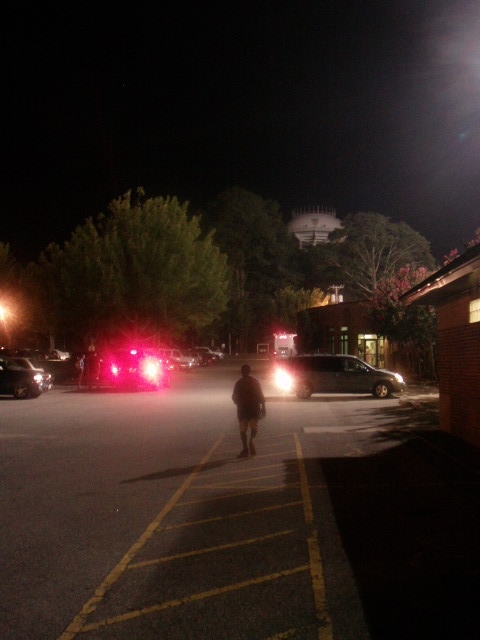 A few minutes later, I was headed out into the North Carolina night. 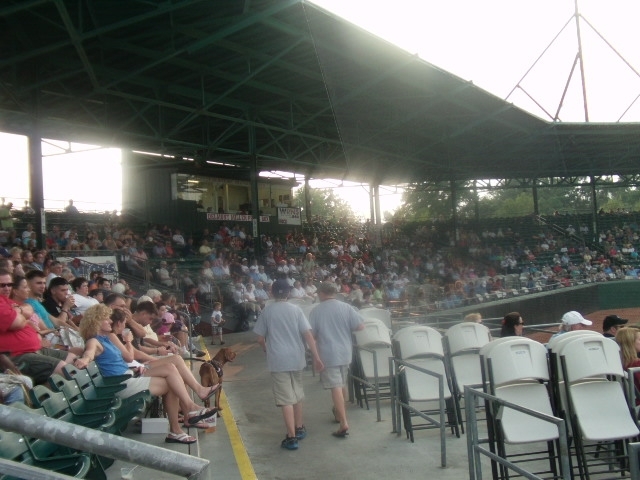 But when it comes to professional baseball in Kinston, here’s hoping that it’s not all she wrote. 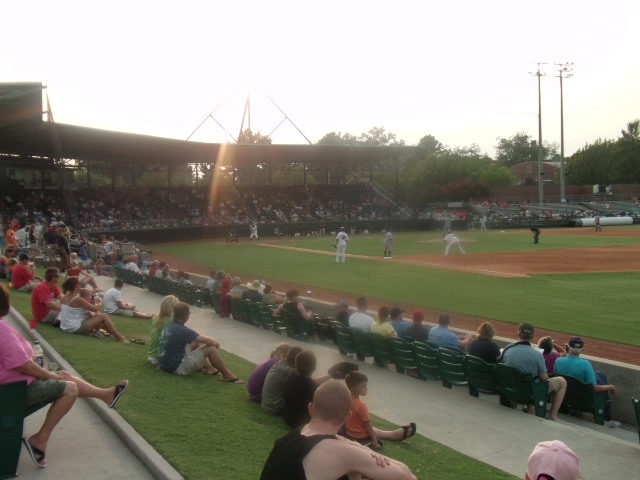 Grainger Stadium is a wonderful place to see a game. Your entries continue to give me the willies. My son is named after a famous musician whose real last name was Zimmerman. Even at 13 months old, he loves Bojangles. 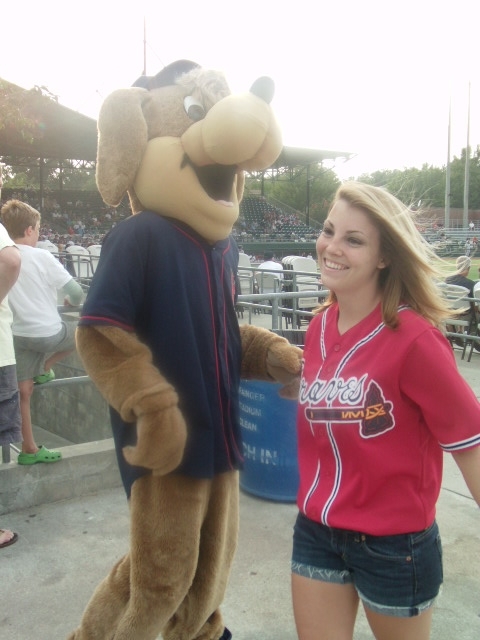 Looking forward to sneaking out of work early & the Dash game tonight. Excellent post Ben. 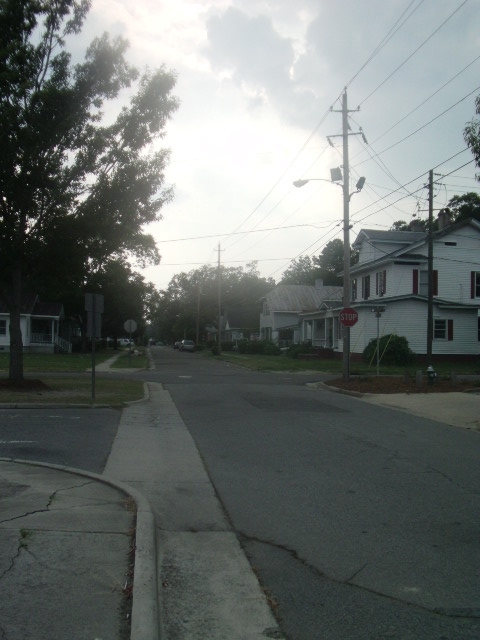 Your pictures and ability to find the best people to talk to really give me great ideas for my next trips, especially to Kinston & Myrtle Beach (I kid you not, those are my next two). 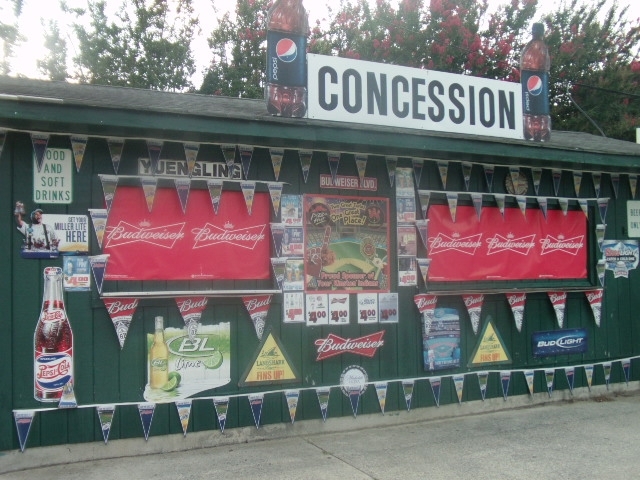 A few friends and myself as planning on going to the Sept 2nd game in Kinston, the “last” game perhaps ever to be played there. It will be my first, but hopefully not my last. It’s amazing to see small town ball. The fans, the city, and the players that embrace it, really make it something that speaks to the uniqueness of baseball. Keep up the great work! And good luck on your next few stops! Hey Nick — Glad I can be of service, and thanks for reading and taking the time to comment. It is always appreciated. 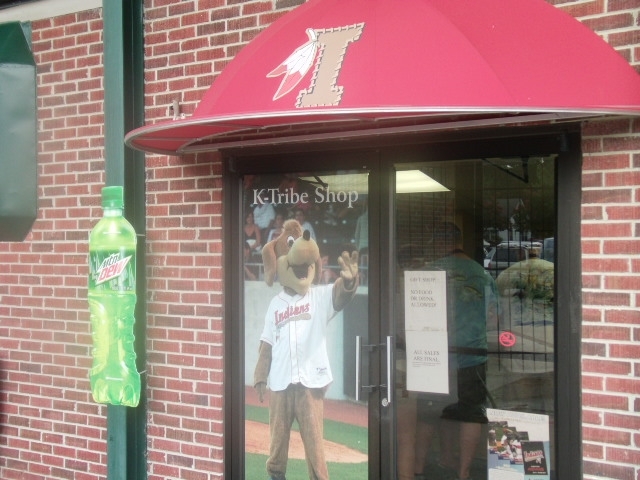 I’ll be interested to hear about the K-Tribe’s last game — my guess is that that’s going to be a very memorable evening. 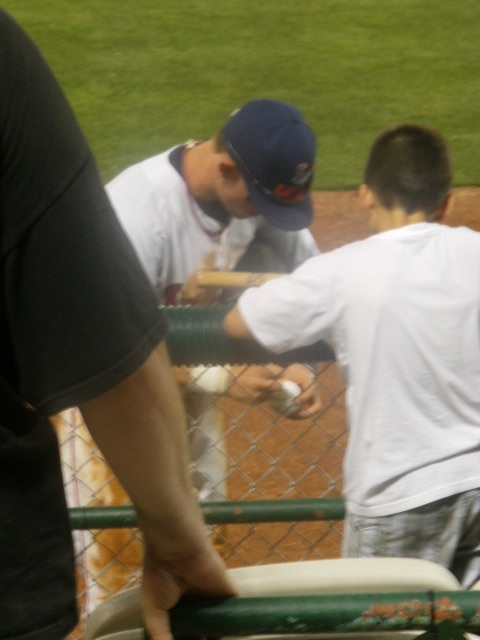 I was at the BP for the last time this season when Frederick was in town. 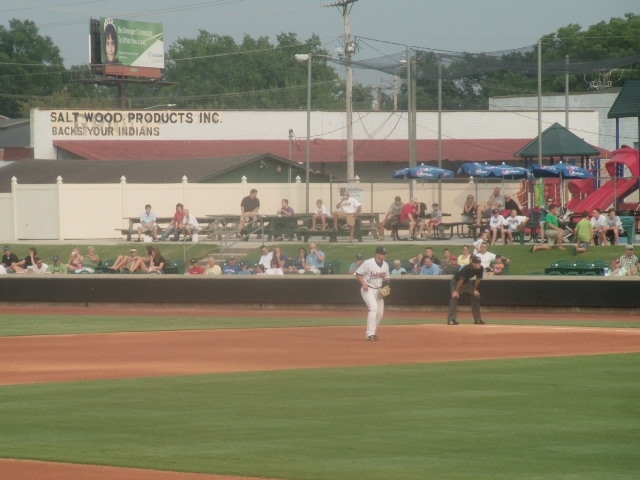 Keys won the game 3-0. Great article and pictures Ben. My wife and I made the trip from Wake Forest to see this game. The bobbleheads are really nice! I wish I had known you were there. You do some really good stuff on MiLB.